Eating salad can be a delicious way to stay healthy. 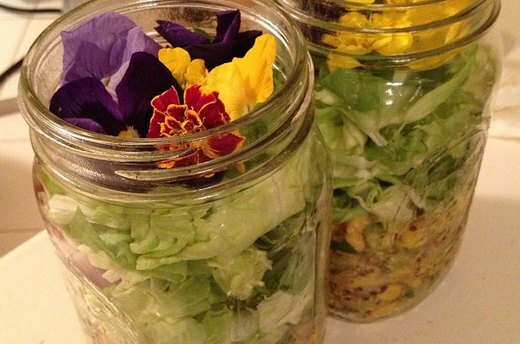 Mason jar salads are pretty, portable, and easy to create. They will stay crisp and appealing for days after preparation if you apply the simple principles illustrated here. 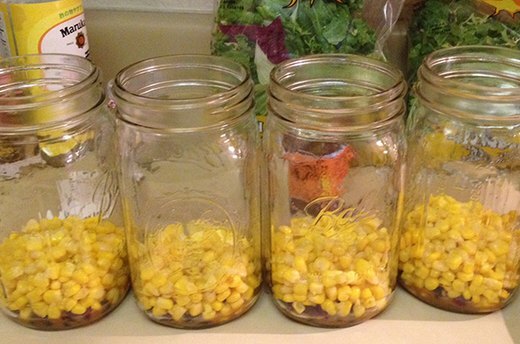 You'll need quart-sized mason jars, salad dressing and your favorite salad ingredients. 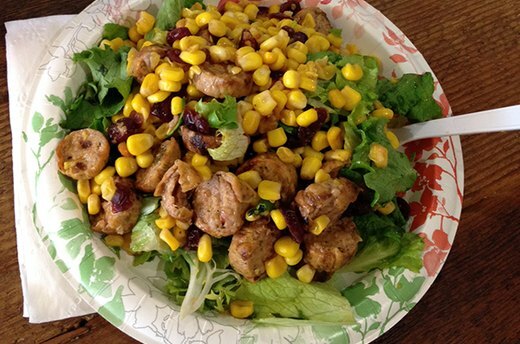 This specific salad is comprised of a homemade pumpkin vinaigrette, dried cranberries, corn, grilled chicken sausage and salad mix. 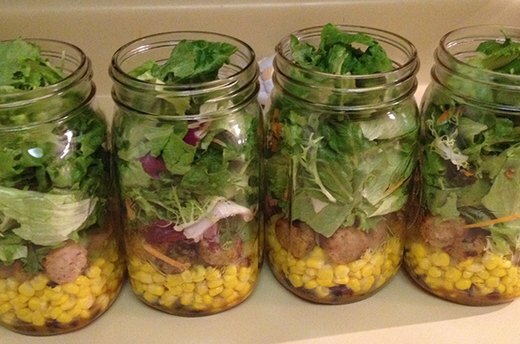 To really save yourself time, prepare multiple mason jar salads at once. 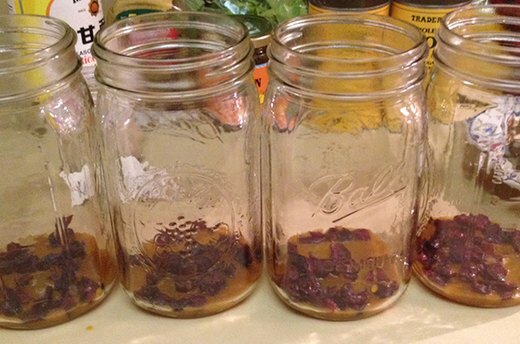 Spoon the dressing into the mason jars. 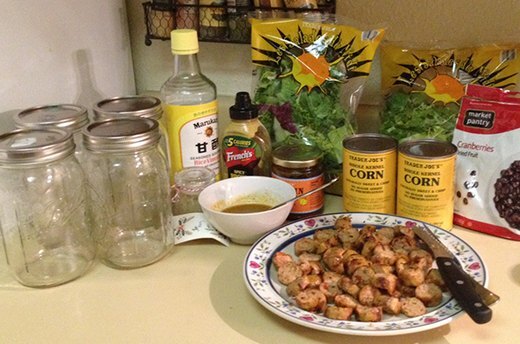 Add ingredients that can marinate in the dressing and still taste great. Dried ingredients, pickled vegetables and root vegetables (such as carrots, radishes and sweet potatoes) work well for the bottom layer. Fill the middle layer(s) of your salad with wet ingredients such as diced tomatoes, cucumbers, corn or anything else that would cause the greens to go soggy. Layer the dry ingredients, like beans, carrots, and meats, above the wet vegetables. This creates a buffer between the wet ingredients and the greens. Finally, stuff the remainder of the jar with the salad greens and salad toppings (such as edible flowers, cheese, croutons and nuts). Close the lid and refrigerate your salad. The airtight seal ensures fresh salad all week long. 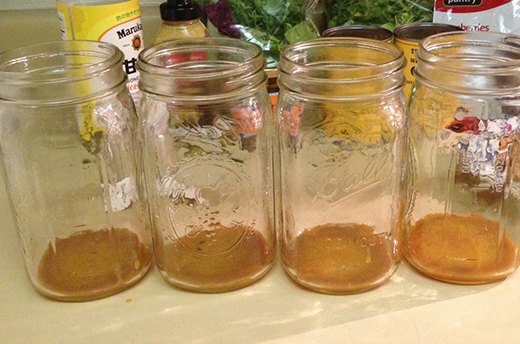 When you are ready to eat the salad, simply invert the jar and give it a good shake. Once the ingredients have been mixed, pour the salad onto a plate and enjoy. Creating new themes and recipes for your salads is part of the fun. 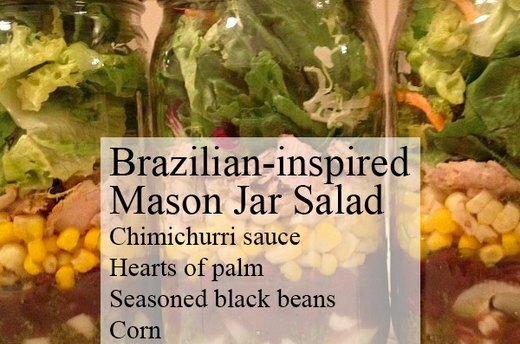 To make a Brazilian-inspired salad, layer chimichurri sauce, hearts of palm, seasoned black beans, corn, grilled chicken and salad greens." Incorporating ingredients with vibrant, contrasting colors can make your salads all the more appetizing. Prepare this salad by layering greens over a Meyer lemon juice-tossed mixture of quinoa, edamame, corn and diced red pepper. Sprinkle edible flowers on top for a lovely pop of color. 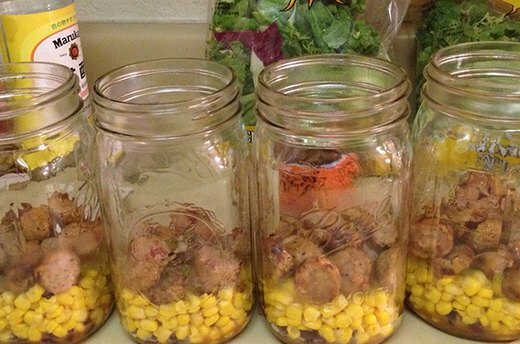 Mason jars can also store salads that don't include greens. Simply layer wet ingredients on the bottom and dry ingredients on top and you'll have a great lunch on the go. 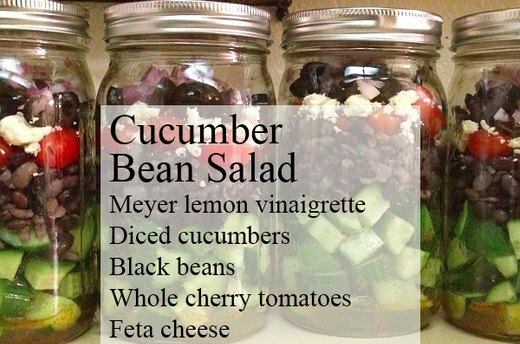 Create this chunky cucumber bean salad by layering Meyer lemon vinaigrette, diced cucumbers, black beans, whole cherry tomatoes, feta cheese, olives and diced red onions.